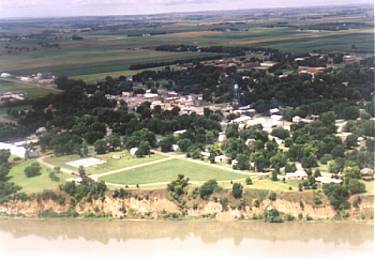 The Bon Homme County area was explored by Lewis & Clark in 1804 and became part of the Louisiana Purchase. Bon Homme village erected the first Dakota Territory Schoolhouse in 1860. General Custer's army camped nearby in 1873 on its ill-fated journey to Little Bighorn. Military wagon trains rolled along the Military Trail west to Fort Randall. Stagecoach routes crisscrossed the county from Bon Homme to Tackett's Station on Choteau Creek to Campbell's Station at Dawson Creek near Scotland, on the Firesteel Trail. Steamboats, stagecoaches and finally trains brought pioneers from many European nations to homestead the land. The first Hutterite Colony in the United States was established in Bon Homme County in 1874 and several continue in the region. The Bon Homme National Cemetery, established in 1859, exemplifies the combined history and scenic nature of Bon Homme County. The Missouri River provides a common thread throughout the history of the Springfield area. Many traveled this area long before Springfield was formed in 1870. Native Americans, fur traders, and the Corps of Discovery were familiar with the mighty river, bluffs, ravines and plains characterizing this picturesque spot. Early brief settlers, wagon trains, and soldiers passed through. Territorial Governor John Burbank requested the platting of a town, which surveyor Ogden Marsh entered into county records on May 2, 1870. Marsh and his family quickly erected a few buildings and became the first permanent residents. Marsh's death in 1872 is the first on record in Springfield. The city is located on an 80-foot chalkstone bluff that extends several miles. By 1874, several businesses were in operation, like the International Hotel, a post office, a saw mill, two general stores, a steam flouring mill, and a harness shop. The Springfield Times remains the oldest weekly newspaper published in South Dakota. The paper hit the streets on July 27, 1871. Steamboats like the Far West, Nellie Peck, Miner, Silver Lake, Ida Stockdale, Esperanza, and Key West, regularly arrived in Springfield with passengers and freight.